(/ˈpɛntəˌtuːk, -ˌtjuːk/), is the central reference of the religious Judaic tradition. It has a range of meanings. It can most specifically mean the first five books of the twenty-four books of the Tanakh, and it usually includes the perushim (rabbinic commentaries). The term "Torah" means instruction and offers a way of life for those who follow it; it can mean the continued narrative from Book of Genesis to the end of the Tanakh, and it can even mean the totality of Jewish teaching, culture and practice. 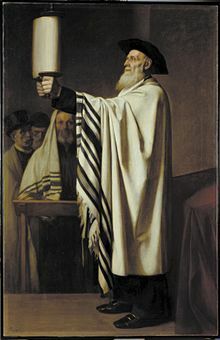 Common to all these meanings, Torah consists of the foundational narrative of Jewish peoplehood: their call into being by God, their trials and tribulations, and their covenant with their God, which involves following a way of life embodied in a set of moral and religious obligations and civil laws (halakha). In rabbinic literature the word "Torah" denotes both the five books (Hebrew: תורה שבכתב‎‎ "Torah that is written") as well as theOral Torah (תורה שבעל פה, "Torah that is spoken"). The Oral Torah consists of interpretations and amplifications which according to rabbinic tradition have been handed down from generation to generation and are now embodied in the Talmudand Midrash. According to rabbinic tradition, all of the teachings found in the Torah, both written and oral, were given by God throughMoses, a prophet, some of them at Mount Sinai and others at the Tabernacle, and all the teachings were written down by Moses, which resulted in the Torah we have today. According to a Midrash, the Torah was created prior to the creation of the world, and was used as the blueprint for Creation. The majority of Biblical scholars believe that the written books were a product of the Babylonian captivity (c. 600 BCE), based on earlier written and oral traditions, and that it was completed by the period of Achaemenid rule (c. 400 BCE). However, the 2004 discovery of fragments of the Hebrew Bible at Ketef Hinnom dating to the 7th century BCE, and thus to before the Babylonian captivity, suggests that at least some elements of the written Torah, were current before the Babylonian exile. The word "Torah" is a tricky one, because it can mean different things in different contexts. In its most limited sense, "Torah" refers to the Five Books of Moses: Genesis, Exodus, Leviticus, Numbers and Deuteronomy. But the word "torah" can also be used to refer to the entire Jewish bible (the body of scripture known to non-Hebrews as the Old Testament and to Jews as the Tanakh or Written Torah), or in its broadest sense, to the whole body of Mosaic law and teachings. To Hebrews and Jews, there is no "Old Testament." The books that Christians call the New Testament are not part of Jewish scripture. The so-called Old Testament is known to us as Written Torah or the Tanakh. This is a list of the books of Written Torah, in the order in which they appear in Hebraic translations, with the Hebrew name of the book, a translation of the Hebrew name (where it is not the same as the English name), and English names of the books (where it is not the same as the Hebrew name). The Hebrew names of the first five books are derived from the first few words of the book. The text of each book is more or less the same in Hebraic translations as what you see in Christian bibles, although there are some occasional, slight differences in the numbering of verses and there are some significant differences in the translations. Hebraic scriptures are sometimes bound in a form that corresponds to the division into weekly readings (called parshiyot in Hebrew). Scriptures bound in this way are generally referred to as a chumash. The word "chumash" comes from the Hebrew word meaning five, and refers to the five books of the Torah. Sometimes, a chumash is simply refers to a collection of the five books of the Torah. But often, a chumash contains the entire first five books, divided up by the weekly parshiyot, with the haftarah portion inserted after each week's parshah. The word "Torah" in Hebrew is derived from the root ירה, which in the hif'il conjugation means "to guide/teach" (cf.Lev 10:11). The meaning of the word is therefore "teaching", "doctrine", or "instruction"; the commonly accepted "law" gives a wrong impression. Other translational contexts in the English language include custom, theory, guidance, orsystem. The earliest name for the first part of the Bible seems to have been "The Torah of Moses". This title, however, is found neither in the Torah itself, nor in the works of the pre-Exilic literary prophets. It appears in Joshua (8:31–32; 23:6) and Kings(I Kings 2:3; II Kings 14:6; 23:25), but it cannot be said to refer there to the entire corpus (according to academic Bible criticism). In contrast, there is every likelihood that its use in the post-Exilic works (Mal. 3:22; Dan. 9:11, 13; Ezra 3:2; 7:6; Neh. 8:1; II Chron. 23:18; 30:16) was intended to be comprehensive. Other early titles were "The Book of Moses" (Ezra 6:18; Neh. 13:1; II Chron. 35:12; 25:4; cf. II Kings 14:6) and "The Book of the Torah" (Neh. 8:3), which seems to be a contraction of a fuller name, "The Book of the Torah of God" (Neh. 8:8, 18; 10:29–30; cf. 9:3). Christian scholars usually refer to the first five books of the Hebrew Bible as the "Pentateuch" (Greek: πεντάτευχος, "five scrolls"), a term first used in the Hellenistic Judaism of Alexandria, meaning five books, or as the Law, or Law of Moses. Genesis begins with the so-called "primeval history" (Genesis 1–11), the story of the world's beginnings and the descent from Adam. This is followed by the story of the three patriarchs (Abraham, Isaac and Jacob), Joseph (Genesis 12–50) and the four matriarchs (Sarah, Rebekah, Leah and Rachel). God gives to the patriarchs a promise of the land ofCanaan, but at the end of Genesis the sons of Jacob end up leaving Canaan for Egypt due to a regional famine. They had heard that there was a grain storage and distribution facility in Egypt. Rabbinic writings indicate that the Oral Torah was given to Moses at Mount Sinai, which, according to the tradition of the Orthodox rabbis, occurred in 1312 BCE. The Orthodox rabbinic tradition holds that the Written Torah was recorded during the following forty years, though many Jewish scholars affirm the modern scholarly consensus that the Written Torah has multiple authors and was written over centuries. of Moses could not have been written by Moses, as writing it would have been a lie, and that they were written after his death by Joshua.Abraham ibn Ezra and Joseph Bonfils observed that phrases in those verses present information that people should only have known after the time of Moses. Ibn Ezra hinted, and Bonfils explicitly stated, that Joshua wrote these verses many years after the death of Moses. Other commentators do not accept this position and maintain that although Moses did not write those eight verses it was nonetheless dictated to him and that Joshua wrote it based on instructions left by Moses, and that the Torah often describes future events, some of which have yet to occur. The Talmud says that God dictated four books of the Torah, but that Moses wrote Deuteronomy in his own words (Talmud Bavli, Meg. 31b). All classical rabbinic views hold that the Torah was entirely Mosaic and of divine origin. Present-day Reform and LiberalJewish movements all reject Mosaic authorship, as well as most shades of Conservative Judaism. Torah reading (Hebrew: קריאת התורה, K'riat HaTorah ; "Reading [of] the Torah") is a Jewish religious ritual that involves the public reading of a set of passages from a Torah scroll. The term often refers to the entire ceremony of removing the Torah scroll (or scrolls) from the ark, chanting the appropriate excerpt with traditional cantillation, and returning the scroll(s) to the ark. It is distinct from academic Torah study. 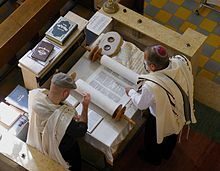 As a part of the morning prayer services on certain days of the week, fast days and holidays, as well as part of the afternoon prayer services of Shabbat, Yom Kippur and fast days, a section of the Pentateuch is read from a Torah scroll. On Shabbat (Saturday) mornings, a weekly section ("parasha") is read, selected so that the entire Pentateuch is read consecutively each year.The division of parashot found in the modern-day Torah scrolls of all Jewish communities (Ashkenazic, Sephardic, and Yemenite) is based upon the systematic list provided by Maimonides in Mishneh Torah,Laws of Tefillin, Mezuzah and Torah Scrolls, chapter 8. Maimonides based his division of the parashot for the Torah on the Aleppo Codex. Conservative and Reform synagogues may read parashot on a triennial rather than annual schedule, On Saturday afternoons, Mondays, and Thursdays, the beginning of the following Saturday's portion is read. On Jewish holidays, the beginnings of each month, and fast days, special sections connected to the day are read. 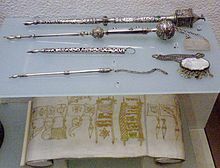 According to Jewish law, a sefer Torah (plural: Sifrei Torah) is a copy of the formal Hebrew text handwritten on gevil or qlaf(forms of parchment) by using a quill (or other permitted writing utensil) dipped in ink. Written entirely in Hebrew, a sefer Torah contains 304,805 letters, all of which must be duplicated precisely by a trained sofer ("scribe"), an effort that may take as long as approximately one and a half years. Most modern Sifrei Torah are written with forty-two lines of text per column (Yemenite Jews use fifty), and very strict rules about the position and appearance of the Hebrew letters are observed. See for example the Mishna Berura on the subject. Any of several Hebrew scripts may be used, most of which are fairly ornate and exacting. Later translations into Greek include seven or more other versions. These do not survive, except as fragments, and include those by Aquila, Symmachus, andTheodotion. Muslims call the Torah the Tawrat and consider it the word of God given to Moses. 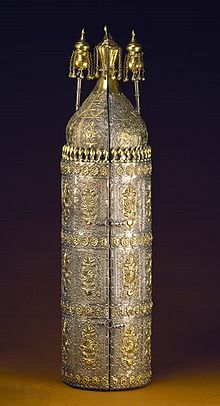 However, Muslims also believe that this original revelation was corrupted (tahrif) (or simply altered by the passage of time and human fallibility) over time by Jewish scribes and hence do not revere the present "Jewish version" Torah as much.7:144–144 The Torah in the Quran is always mentioned with respect in Islam. The Muslims' belief in the Torah, as well as the prophethood of Moses, is one of thefundamental tenets of Islam. Jump up^ Neusner, Jacob (2004).The Emergence of Judaism. Louisville: Westminster John Knox Press. p. 57. "The Hebrew word torah mean 'teaching.' We recall ... the most familiar meaning of the word: 'Torah = the five books of Moses," the Pentateuch .... The Torah may also refer to the entirety of the Hebrew Scriptures .... The Torah furthermore covers instruction in two media, writing and memory .... [The oral part] is contained, in part, in the Mishnah, Talmud, and midrash compilations. But there is more: what the world calls 'Judaism' the faithful know as 'the Torah.'" Jump up^ page 1, Blenkinsopp, Joseph (1992). The Pentateuch: An introduction to the first five books of the Bible. Anchor Bible Reference Library. New York: Doubleday. ISBN 0-385-41207-X. Jump up^ Davila, James, "MORE ON THE KETEF HINNOM AMULETS in Ha'aretz,"Paleojudaica, Sept. 2004. Jump up^ Barkay, Gabriel, et al., "The Challenges of Ketef Hinnom: Using Advanced Technologies to Recover the Earliest Biblical Texts and their Context", Near Eastern Archaeology, 66/4 (Dec. 2003): 162–171. Jump up^ Rabinowitz, Louis Isaac and Harvey, Warren. "Torah". Encyclopaedia Judaica. Ed. Michael Berenbaum and Fred Skolnik. Vol. 20. 2nd ed. Detroit: Macmillan Reference USA, 2007. pp. 39–46. Jump up^ Sarna, Nahum M. et al. "Bible". Encyclopaedia Judaica. Ed. Michael Berenbaum and Fred Skolnik. Vol. 3. 2nd ed. Detroit: Macmillan Reference USA, 2007. pp 576–577. Jump up^ The World and the Word: An Introduction to the Old Testament, ed. Eugene H. Merrill, Mark Rooker, Michael A. Grisanti, 2011, p, 163: "Part 4 The Pentateuch by Michael A. Grisanti: The Term "Pentateuch" derives from the Greekpentateuchos, literally, ... The Greek term was apparently popularized by the Hellenized Jews of Alexandria, Egypt, in the first century AD..."
Jump up^ Louis Jacobs (1995). The Jewish religion: a companion. Oxford University Press. p. 375. ISBN 978-0-19-826463-7. Retrieved 27 February 2012. Jump up^ McDermott, John J., (2002). Reading the Pentateuch: a historical introduction. Pauline Press. p. 21. ISBN 978-0-8091-4082-4. Retrieved2010-10-03. Jump up^ Riches, John (2000). The Bible: A Very Short Introduction. Oxford: Oxford University Press. pp. 19–20. ISBN 978-0-19-285343-1. Jump up^ History Crash Course #36: Timeline: From Abraham to Destruction of the Temple, by Rabbi Ken Spiro, Aish.com. Retrieved 2010-08-19. Jump up^ Berlin, Adele; Brettler, Marc Zvi; Fishbane, Michael, eds. (2004). The Jewish Study Bible. New York City: Oxford University Press. pp. 3–7. ISBN 978-0195297515. Jump up^ Nadler, Steven; Saebo, Magne (2008). Hebrew Bible / Old Testament: The History of its Interpretation, II: From the Renaissance to the Englightenment. Vandenhoeck & Ruprecht. p. 829. ISBN 3525539827. Retrieved 18 September2015. Jump up^ For more information on these issues from an Orthodox Jewish perspective, seeModern Scholarship in the Study of Torah: Contributions and Limitations, Ed.Shalom Carmy, and Handbook of Jewish Thought, Volume I, by Aryeh Kaplan. Jump up^ The Authentic Triennial Cycle: A Better Way to Read Torah? Jump up^  Archived August 17, 2012, at the Wayback Machine. Jump up^ "FAQ for Humanistic Judaism, Reform Judaism, Humanists, Humanistic Jews, Congregation, Arizona, AZ". Oradam.org. Retrieved 2012-11-07. Jump up^ B. Barry Levi, Fixing God's Torah: The Accuracy of the Hebrew Bible Text in Jewish Law, Oxford University Press, 2001, p. 4. Jump up^ Greifenhagen, FV., Egypt on the Pentateuch's Ideological Map: Constructing Biblical Israel's Identity, Continuum, 2002, p. 218. Clines, David A (1997). The theme of the Pentateuch. Sheffield Academic Press.ISBN 9780567431967. Gooder, Paula (2000). The Pentateuch: a story of beginnings. T&T Clark.ISBN 9780567084187. Ska, Jean-Louis (2006). Introduction to reading the Pentateuch. Eisenbrauns.ISBN 9781575061221. Look up Torah orPentateuch in Wiktionary, the free dictionary.